Five Point Move is proud to host US Greco Roman National Team Head Coach Matt Lindland every week for “Coach Lindland’s Report.” For fans and wrestlers looking for insights regarding the US Greco National Team, we ask Coach Lindland some questions to get his take on training and upcoming competitions. If you have any questions you’d like us to ask going forward let us know via Facebook, Twitter, or through our Contact page. 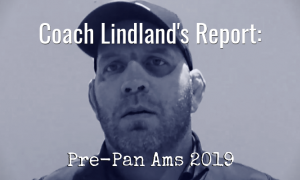 This week, we asked Coach Lindland about how the guys are doing in preparation for the US Olympic Trials, which take place this coming weekend in Iowa City. 5PM: What does this week look like as far as preparation? Coach Matt Lindland: As far as the training for the athletes, this morning we had our last workout. We had six minutes of live training and that was it. We had a nice warm-up, we did six minutes of live and finished with a game. And then this afternoon, athletes can come in and work on some individual stuff on their own. If they want to get on the mat or just cut some weight, they’re welcomed to do that. Then the rest of the week I’d really like to limit them to maybe just get on the mat one more time, just on their own type of thing. I really want these guys peaked and ready. I was over at the Army program last week and everybody is looking great over there. Everybody’s healthy in our room. We had Jordan (Holm) and Joe Rau out here training for the last two weeks, they just went home on Saturday. They were here for two weeks training with us and both those guys are looking sharp. I’m excited to see what’s going to happen. I really don’t know at a few of these weights who is going to come through. I think it’s going to come down to whoever is going out there and looking to put points up on the board. 5PM: Being that this is the last prep week before the Olympic Trials, is there a kind of palpable anxiety for athletes as it’s drawing closer? ML: I would think some athletes it depends on how they approach it. I think a more appropriate approach would be a level of excitement. Anxiety is pretty negative. You know, if you have a lot of anxiety going into a meet… I mean, I could see even being nervous, but that nervousness should lead to excitement and allow you to compete at the best of your ability. I think if you have anxiety you’re tense, you’re tight, you’re not ticking correctly, and you’re not going to perform optimally. 5PM: Whomever makes the team at the unqualified weights, they’re turning right around and going to Mongolia, is that correct? 5PM: What does the immediate future following the Trials look like for the athletes who don’t have to qualify a weight class? ML: They get to rest (laughs). They get to take at least a week off. I scheduled a camp with Robby (Smith) and Andy (Bisek) to coach some youth wrestlers up in Alaska. It’s a wonderful camp. I’ve done it two years in a row. This year I am going to be busy, so I reached out to the camp director up there in Alaska. Last year I took Andy with me, the year before it was just me. But the camp has grown, so we needed two coaches. So Andy and Robby are going to get some R&R up in Alaska, take a little time off. I hope whoever makes it at 85 kilos does the same thing. But unfortunately, the guys who do make the team (at the unqualified weights) are going to have to get right back up. They’re going to get a couple days off and then get back on a plane Thursday. They’re traveling home on probably Monday and then getting on another plane Thursday. 5PM: Well, that’s what you sign up for. ML: That’s the deal, we should have got it done earlier. Should have done it at the Pan Ams. 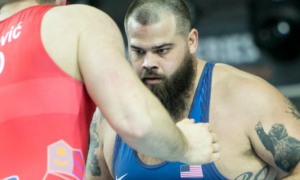 Be sure to follow Coach Matt Lindland on Facebook, Twitter, and his official blog for updates as we head closer to the Rio Olympics.